Yes, the title is a bit tongue in cheek - my pumps do not actually have a steel toe. But I just had to share this story with you. You see, last week, I was in Canada for work. I had a meeting on Thursday at a job site currently under construction. The complex is huge with multi-story buildings, underground parking, and even a sports arena all concurrently under construction. I found out 3 days before the meeting that they're pretty strict about steel toe shoes. Well. As much of a shoe addict as I am, and despite the fact that I've been in the construction industry for over a decade, I've never needed nor do I own a pair of steel toe shoes. I ended up finding a pair on Amazon that I could get the next day with our Prime account. But I also wanted to find a pair in a brick and mortar store in case the Amazon pair didn't work out. After all was said and done - I got this pair of Red Wing boots. Beautiful, right? Contextually speaking of course! My next dilemma was how I was going to style them. I actually always struggle with this - trying to be practical on a construction job site, while still showing hints of style, but also looking somewhat authoritative since I'm a female in a predominantly male industry. Here's an evolution of my outfit options along with my thought process. I'll give you one guess who helped me make my decision? I started with some trouser jeans, a striped top, and my company logo'd vest. I was afraid this was too casual and Gina thought I could be mistaken to be fresh out of college, so I switched to a blazer and portofino with the same jeans. Gina favored the blazer look but felt the boots looked more awkwardly out of place, and I agreed. So, I swapped out the trouser jeans for some khakis. Much better - now your eye doesn't go straight to my feet! Except, something still felt off to me. I decided to switch the blazer with the same one I'm wearing in my blog sidebar. It leaves the top of the outfit monochromatic, but the subtle animal print is my hint of girliness that I cling to. What a long and drawn out process, no? And after all that hemming and hawing and trial and error, I didn't even think about the safety vest that would end up going over my outfit anyway. I had to act like I was taking a picture of a building so I could sneak this selfie for you guys! 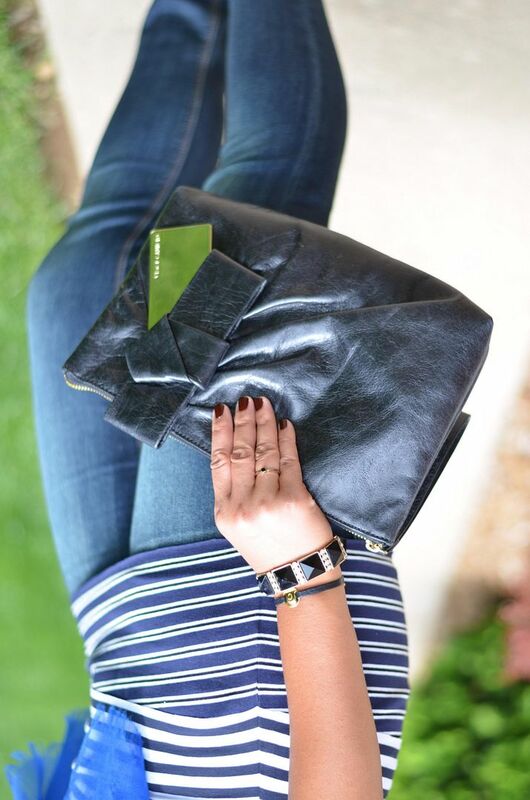 Linking up for: Friday's Fab Favorites, Casual Friday, Weekend Wind-down. Also - please stop by and see Amber at InDuffinitely Me! She's featuring one of my looks, so show her some love, please! How cute are those?!?! Happy Friday! They're really awesome. I just love them! LMAO - I would hem and haw over that as well! You did a great job of blending the boots and looking both girly but professional! Great job. It was treacherous!! I can dress for business meetings all day long but job site meetings are the worst!! Haha...but I have to say "oh la la...those shoes are very cute!" Thanks! *Those* shoes are fab! 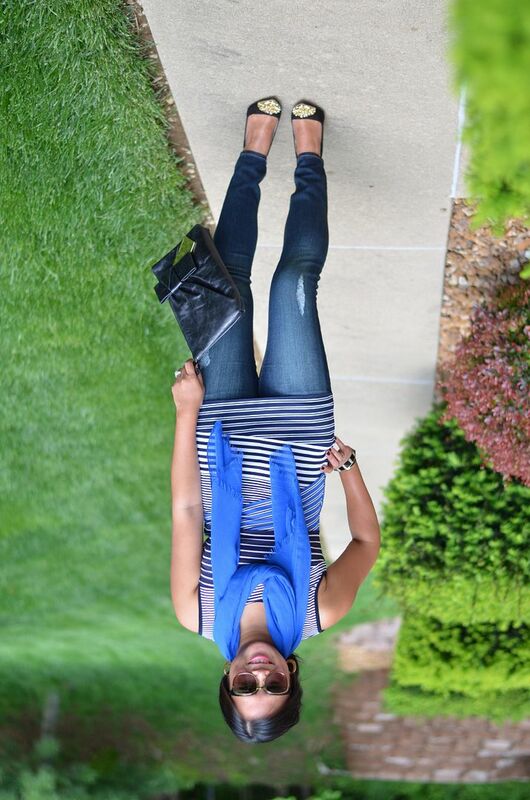 the color of that blue scarf is gorgeous, and I really like your jeans! I haven't shopped at Express in a while, but maybe I need to stop by. Yes you definitely should! These jeans are by far the best fitting and most comfy I own! Love your shoes and that top. Good effort in dressing up for work. Great pic of you in your hard hat! For my work, I have to wear steel toed boots all the time!! But that does not deter me from wearing them with my dresses and skirts. Albeit i look absolutely silly in them, but work is work and fashion is fashion ;). Who said one cant go with another. 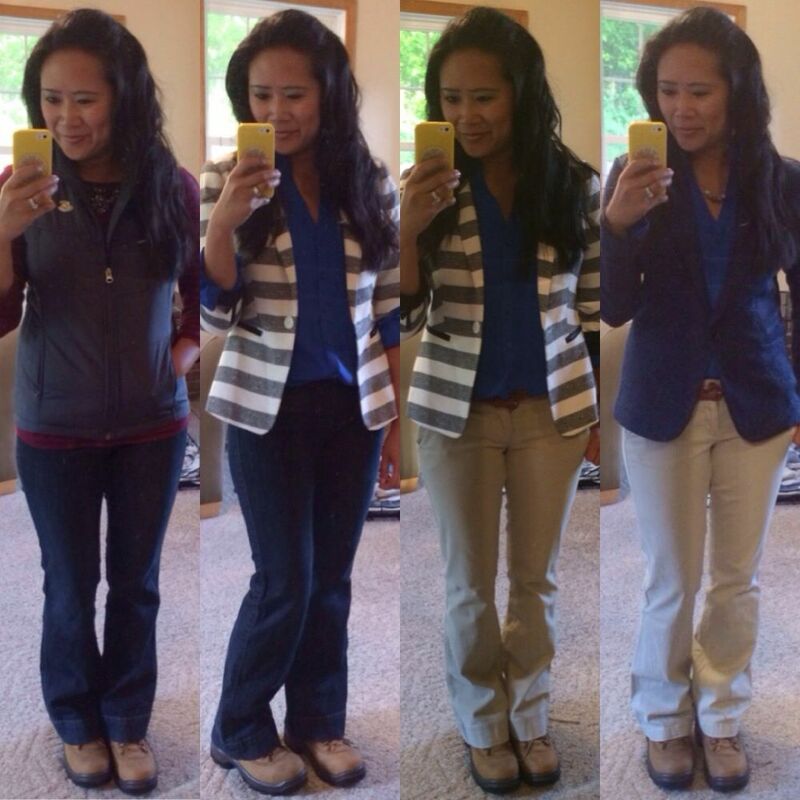 Love the third selfie outfit the most!! Glad you can relate!!! I wish there were fashion blogs out there for people like us! Hahaha thanks!! Glad you enjoyed it! I felt ridiculous but it was a great experience at least!! The pointy heels are fab! LOL this made me laugh! I don't know how I would style some steel toe boots, but you did a great job! 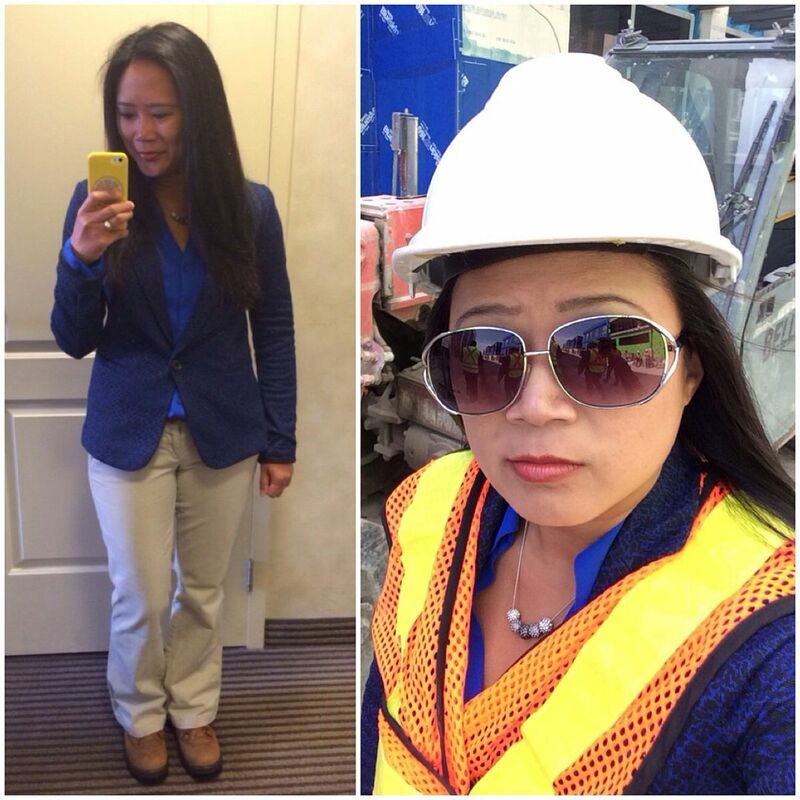 And the hard hat and vest look fab :) Have a great weekend! Thank you for that confirmation! I was seriously the only female on site. I'm sure the guys could not care less!! I love it! Thanks for sharing and linking up with us at the #WWDParty! Haha I loved this post!! I think I have the same issue with my hiking boots...I should do a post on how to look cute for a 6-mile hike, lol. Styling those boots was definitely a challenge, but I think you did well! As for those glitter tipped pumps... so in love! Thank you!! 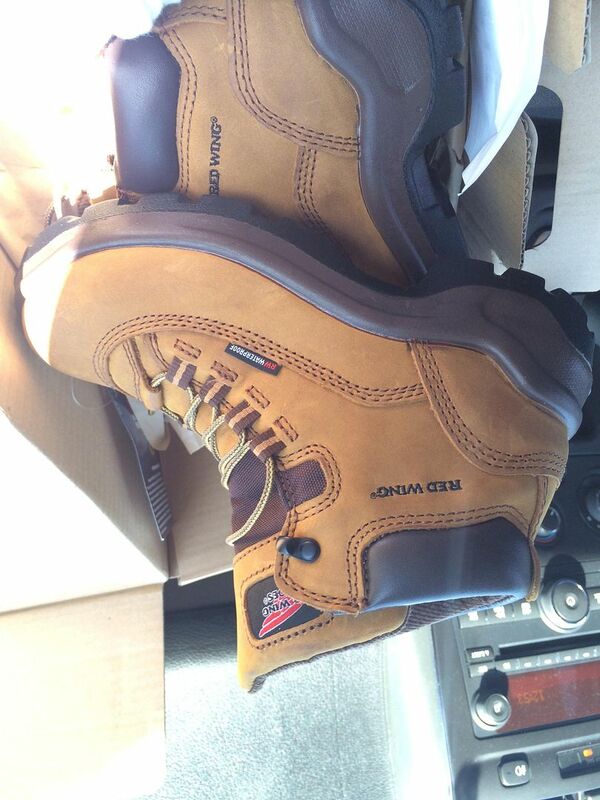 When they told me I needed steel toe shoes, someone sent me a pic of these and said I should NOT wear those! :) they know I'm a bit of a girly girl! That Gina sure is opinionated and bossy! But seriously, this was quite a fun and unique fashion challenge and I'm glad I got to be part of the journey. And Iooove how you styled that tank!!! Such cool piece. Now they need to make one with a wider scoop neck for me! I know right! You need it! It would look amaze on you!!! OMG I am in love, lost, adornment and everything else love-related lol with your gorgeous bejeweled-cap black pumps. The clutch is nice too. 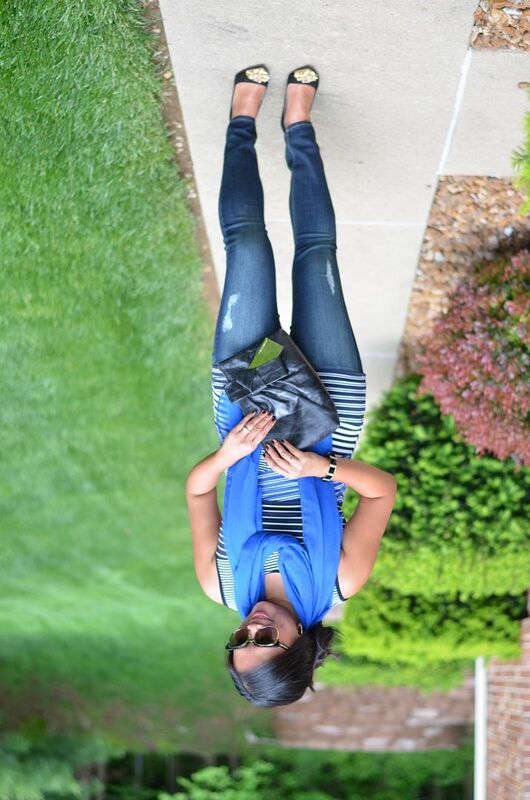 Way to dress up jeans and a striped tank (cute tank btw!!) I pinned this look and also the fab shorts' outfit featured on Amber's Blog. The shorts, blouse & sandals worn there are stunning!! The shoes are my only zara shoe purchase but they're just so wonderful! I need more clearly! As always, you look so good! I once again, love your look. I am pining the first pic with those AMAZING shoes! Well, thanks, girl! Glad you love them! Umm love the shoes! Actually, the whole outfit! The top and the scarf go perfectly together. I thought the scarf was a nice touch - thanks! I love the first pic with those totally amazing "steel toe" shoes!! I love the detailing on those. So chic! I'm a sucker for studs! I couldn't resist! Girl I am obsessed with my hair! Love these curls, they are just so fun!! !